This 3br/2ba contemporary home is in the überhip 12South district in Nashville. It blends creativity and respect for the vibrant patchwork quilt that is the neighborhood - located in 12 South- Belmont/ Vanderbilt Area. Eateries, coffee shops, boutiques, restaurants and bars are yards away and there's always a steady flow of folks on foot, jogging, shopping, pushing strollers and interacting. It's as if there's always a neighborhood tour in progress. A few places not to miss: Jeni's Ice Cream, Josephine's, Portland Brew, Urban Grub, Taqueria Del Sol, Burger Up, Las Paletas, The Tap Room, Mafiaoza's, The Frothy Monkey, Imogene and Willies, Savant Vintage, Emerson Grace, and Hero. And, the newly added restaurants, Epice and Flipside, are quickly becoming hot spots in the area. There are 3 bedrooms in this home- a Master Bedroom with queen sized bed; a second bedroom also has a queen sized bed. The third bedroom has a queen sized bed. This home will sleep 8 if you want to sleep on the large sectional, or bring an airmattress. Plenty of parking, combined with a garage, and fenced in back yard. Do you need to contact us? The best way is through the VRBO site. ***also note- we live right down the street should you have any questions, or need immediate help. Please disclose accurate information regarding the number of people in your party. This home is intended only for the number of people on your reservation, or the $295 security deposit will be forfeited. Please also note: there is an old security system that had surveillance cameras on the outside of the house, installed before we purchased the home. We do not use it, nor is it functional. In full disclosure, we wanted to let guests know that these old cameras are mounted outside and are not used. 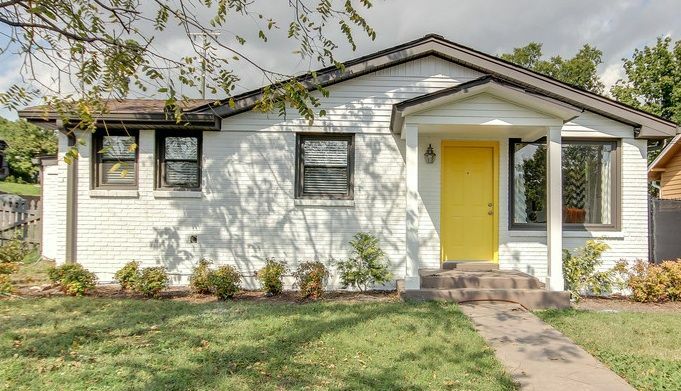 Keywords: 12th South, Vanderbilt, Downtown, Belmont, Green Hills Central Location, this Contemporary Cottage is perfect for your visit to Nashville, the ultimate in convenience, and walkable eateries and shopping. A relaxing getaway, right in the middle of town. A parking garage, and private fenced back yard provides the ultimate in privacy and security. 12 South Village full of shopping and restaurants. Very nice little house in a great location. 12 South is a hopping area and we loved the restaurants, coffee shops, etc. There is a Kroger supermarket within walking distance. When we wanted to explore other parts of Nashville, we were able to get an Uber in less than five minutes - and that was many times. House was very tidy and a little tired but very good for our four days stay. The house was a perfect place to stay for my bachelorette weekend! It held our group of 8 comfortably, and is in a great location! Everything that we did was approximately a 5-10 minute Uber of Lyft ride away. The house was very clean, and just as the description and pictures portray. I would definitely stay here again on a future trip! This rental home was just perfect. Close to downtown and some great restaurants. Everything was as renters said it would be. I would definitely stay here again. We had a great trip! The house was perfect for my family. We had 3 couples and one extra person but it was spacious and had enough seating for all of us! We had no clue we were within walking distance of 12 South, which is a great place for food or coffee. And cute little shops! Downtown was a 10 minute Uber ride so it wasn't bad at all! The house was very clean, neat, and had everything we needed for our weekend stay. The only concern was the garage and gate. The check in instructions said there would be a garage and gate opener but we only found the garage opener. I messaged the owner but never received a reply. Also one night when we got back to the house the garage door was open when we know for a fact that we closed it, it was a little freaky because we were lucky no one walked into the house and stole our things. Also the house is on the corner of a semi busy road so we did hear cars passing by throughout the night. Other than that this house is perfect for a weekend or longer stay! Nice sized bedrooms. Great art. Ample seating. Exceptional cable. Very clean. Plentiful parking. Prompt and responsive owner. Well outfitted. Convenient location. Would definitely stay again. We had a great trip ! The house was in the perfect location for every thing. It is walking distance to dinning and coffee and only a 7-10 min. drive to almost every where else. We had 3 couples in the house and we had plenty of room. The beds were good and having a washer and dryer was key. The house was clean and the kitchen was stocked. I would totally stay here again. In the heart of 12th South. Rates are subject to change without notification. Minimum weekend rental is 3 nights.